Sloanbook: Football Marathon & Awesome Weekend! 3) that Sunday is Kevin's birthday! We will be making lots of yummy food and having fun! Happy Birthday honey!!! 4) big news droppin the blog on TUESDAY! You cannot miss it if you happen to live in Utah...nope, I'm not pregnant (always have to get that out there)...but come back on Tuesday! I can't wait to hear the big news! Enjoy your football games! It's funny how when you're a girl and say you have "big news" everyone always assumes you're pregnant :) Have a great weekend, Ashley! Mmmm! I love football weekends! Makes me SO excited for fall! Whoop whoop for Tuesday!! :D haha! Have fun this weekend! yay! hoping to watch the alabama game today. Big news?! hmmmm, i wonder what it is...can't wait to hear! Yay I'm excited for big news! And I'm also excited for football this weekend as well! Except I'll be wearing red for Utah...don't hate! haha I totally thought you were going to say you were pregnant! Have fun at the game tonight! I hope our cougars win too! I always have to put the "I'm not pregnant" disclaimer out there too haha. hey girl! my husband goes to BYU now studying business finance. he's also SUPER excited for the game tonight. we won't be going but will be watching it on the TV for sure. traffic in provo is about to get really crazy! thanks for stopping by the blog. you and your husband are adorable. can't wait to hear the big news for what is happening on Tuesday! Haha, awkward....I'm a Ute fan. But good luck to you! Still love your blog. Ha! I love that you are at a football game and you still look all girly and feminine! Hope you have fun at your games AND at Kevin's birthday. Yay for getting to eat a ton of yummy food!! What is happening on tuesday?!?! That is too far away. I hope you two had fun at your football game!! 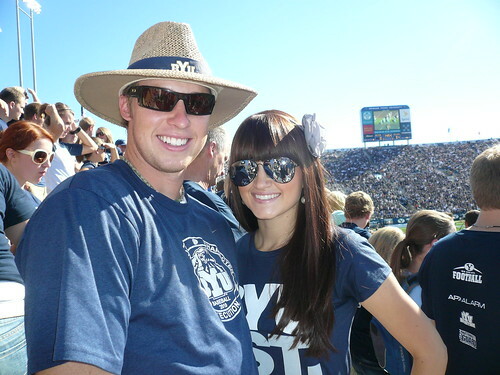 :) Covey and I went to the byu-utah game (haha, although the outcome was pretty sad. and awkward...) but we still had a great time! also.. I have a friend that also grew up in fort collins, do you know Jennifer Stacey? looks like a fun game! finally experienced my first college football game and love it! Im not much of a football girl myself, but my husband LOVES football so its growing on me =). You look beautiful.